Someone at Goodreads said that Fly By Night was “written as a gushy Valentine to the English language” and I’m hard pressed to come up with a better description. Because that’s exactly what this book is. The papery sound of rain. The captain was a grim-smiling river-king named Partridge. There was something crooked in the make of his right wrist, as if it had been broken and never quite healed, and something crooked in the corner of his smile, as if that too had been broken and put back together slightly wrong. You read this and can perfectly hear that sound and clearly picture the kind of smile she means. I love it when an author uses diagonal ways to create an exact image. 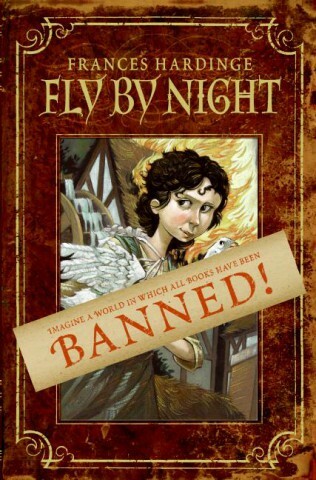 Fly by Night is the story of 12-year-old Mosca Mye. She loves words and it’s her favorite treat to find new ones she can play with. Before her father died he taught her how to read, and in doing so he broke convention. You see, Mosca lives in a world where education is feared and books are seen with distrust. When as travelling storyteller called Eponymous Clent (how great is that name?) passes through her town, she see him as her (and her pet goose Saracen) way into the big world. But Eponymous is not all that he seems and he takes her on an adventure that reaches the Kingdom’s highest circles. In the end, it’s a book about books, written by a book lover for other book lovers and I think you’d enjoy it. The second of the series, Twilight Robbery, is already out there. Okay. Your review got me. This ones going near the top of my TBR list. If the excerpts you used are any indication, this will become a favorite of mine as well. Thanks for sharing! I love the quote about true stories! I’ve never heard of this, but it’s going on my list, I love writers who are really clever with words. Ooh – this sounds like everything Inkheart could have been but failed to be (to me). I want it! Some advice, the sequel is much better – I loved this one but thought it had problems. But like Gullstruck Hardinge, Twilight Robbery has no flaws. If anybody wants to try her work, they do not have to start by this one,they can start right at Twilight Robbery. This sounds so cute, but with a bite! I like it! A GUSHY LOVE LETTER TO THE ENGLISH LANGUAGE??? How could ANYONE (including me) say no? @Joanna: I think you’d like it, Mosca is a great heroine. @Nymeth: Completely agreed, it’s everything Inkheart promised to be. I’m glad to see I wasn’t the only one not in love with it. @T: The second is already on the wishlist priority list. @Steph: I couldn’t have put it better! @Books are my Boyfriends: I also think you’d like Mosca. Give it a try! Hello. impressive job. I did not expect this. This is a great story.